Women’s basketball games are sparsely attended, due in part to the production on the court. 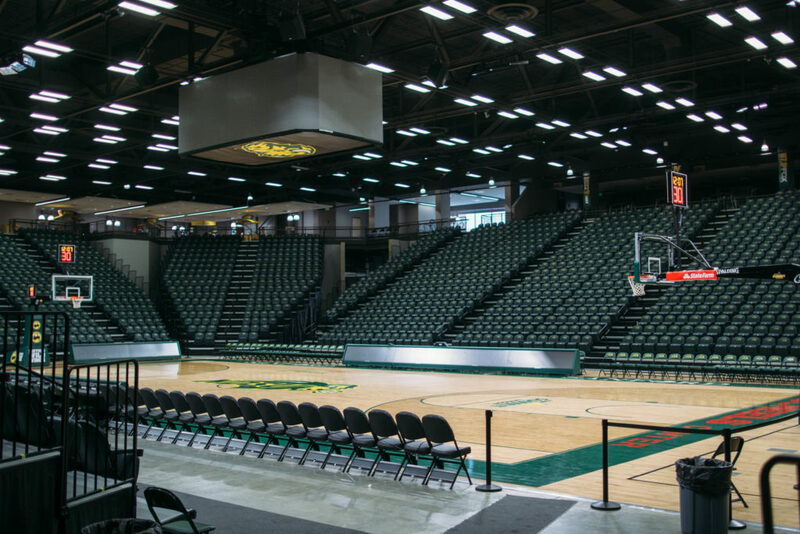 Over the past few years, there has always been a difference in the atmosphere surrounding the Bison men’s and women’s basketball teams. No matter the matchup, the men’s basketball product as a whole is more complete: better action on the court and better intensity off the court. Even as both teams languish in the middle to lower parts of the Summit League standings, the differences are striking. The men averaged an attendance of over 2,700 last season while the women drew just over 768 in 14 games. Only twice did the women draw a four-digit attendance. So, where has it gone wrong for the Bison women? After five Division II championships in the 1990s, the program has struggled in postseason play and lately in the regular season play as well. There is no way to sugar coat it: the Bison women have won exactly one game at the Summit League tournament. They have missed the tournament the same amount of the times as they have won a game. That on court play is a real reason why the stands are not being filled. Women’s basketball can be a bit slower than the men’s game, but that isn’t the real issue. The fact that it isn’t uncommon for the Bison to miss five or six shots in a row can easily take a fan out of the game. Over the last three years, writing NDSU scoreless in over three and four minute spans is not uncommon for those covering the team. Basketball is a game of scoring, and when that dries up, there isn’t much to energize the crowd. The scoring average this year is down around 10 points per game at this point of the year, from 67.4 to 57.6. That scoring drop comes from a larger problem for the program. Last year’s leading scorer Reilly Jacobson transferred to Western Michigan last month. The second leading scorer Sarah Jacobson is redshirting this season. On the recruiting front, it seems NDSU is struggling. The Bison gained a pair of commits in November, but none from North Dakota. NDSU has built a history of players from the Dakotas, Minnesota and Iowa. A majority of the women’s basketball inductees come from the region. NDSU has lost out in recruiting area players. Lexi Klabo is the example of the moment when the Fargo Davis product signed with North Dakota, and she currently leads the Summit League in scoring. The players that have come to NDSU under head coach Maren Walseth haven’t stuck around for long. Besides Reilly Jacobson, Autumn Ogden, Kennedy Childers, Megan Gamble and Brook Yaggie are just some of the players that have left the program. Part of that reason might be a lack of a production from each player. Childers was the most productive at just over 6 points per game. Over the last three years, the phrase “a young Bison squad” has continued to be used. Usually, teams stay young for two years at most. Veteran leadership is hard to come by, as just one senior is listed on the roster this year. Next year, the potential of three seniors will make it the largest senior class since 2016-17, should the team stay together. For the off the court issues, there is no quick fix at all. Getting students into the seats will be the first goal. Hopefully, any momentum with attendance increases can start to roll. A four-game home stand will be the chance to save the season. With winnable games and the Pink game against Oral Roberts upcoming, the atmosphere could get better. Also helping is a trio of doubleheaders with the men’s games, though the women are the matinee performance for each. If not, then the decline will continue. Stopping it is not a simple task, but the performances on the court will dictate how the response off it will change.